Exercise has been used as an intervention for many diseases; however, to maximize the benefits of any exercise intervention there we must understand that exercise is not a blunt, unidimensional tool; but rather, a malleable prescriptive instrument that can address the specific needs of each population. Parkinson’s disease predominately affects motor function in older persons. Bradykinesia, simply defined as slowness of movement, is one of the major motor symptoms of the disease that presents in laboratory assessments as decreased mechanical power and movement speed, which significantly reduces walking speed and consequently increases fall probability and reduces physical independence. Fig. 1. a) Force-velocity relationship (———) in skeletal muscle with power curve (- – -) illustrating the areas of high-load, low velocity and low-load, high-velocity which can be incorporated as part of an effective exercise prescription. b) Training cycles for the study showing periodized patterns including biomechanically-specific translational recovery periods. Power, the rate of doing work, is the product of force and movement velocity and is commonly illustrated as a component of the force-velocity curve (see Figure 1a). Because maximal power is the area (see labeled line) where the product of force and velocity produces the highest value, most training studies have used this “optimal load”. There are, however, a number of factors which can modulate optimal load such as joint mechanics, loading techniques (machines, free weights, tubes and bands), and most important to the current discussion, targeted results. The theory of speed-specificity tells us that to “get fast we must train fast”; therefore, we train power at the low load end of the curve when velocity is the dominant goal, while training at the load end of the curve favors the force (strength) component of power. Because bradykinesia is with reduced power at the velocity end of the curve, we provided training to fourteen Parkinson’s patients (compared to 12 non-exercising controls) using low-load, high-velocity resistance training. The program used evolving optimal loads on eleven pneumatic resistance machines (Keiser, CA). Lifting was performed in circuits by moving from one machine to another. Participants performed two sessions per week for 12 weeks employing three circuits of 10-12 repetitions per machine while alternating upper and lower body exercises. Training loads on each machine were determined using the highest power produced across seven relative intensities between 30 and 90% 1RM. Following a one-week adaptation period, training loads for each exercise were increased each week based on participants’ reaching power plateaus. Briefly, when power did not increase by at least 5% across two consecutive sessions, loads were increased by 5% and training continued until the next power plateau. For each exercise, participants were instructed to exert force as fast as possible during the concentric (lifting) phase and move slowly through the eccentric (lowering) phase. Given that recovery is necessary for adaptation and improvements are normally reflective of movement patterns (biomechanical specificity), two 2-week (weeks 5 & 6; weeks 11 & 12) low-intensity, high-speed translational training cycles were incorporated into the program. These cycles utilized balance and agility activities, including line, cone, ladder, chair, step, and ball drills, designed to improve movement speed and coordination, thereby translating improvements in strength and power into improved functional performances using motor skill practice. The pattern is presented in Figure 1b. Fig. 2. 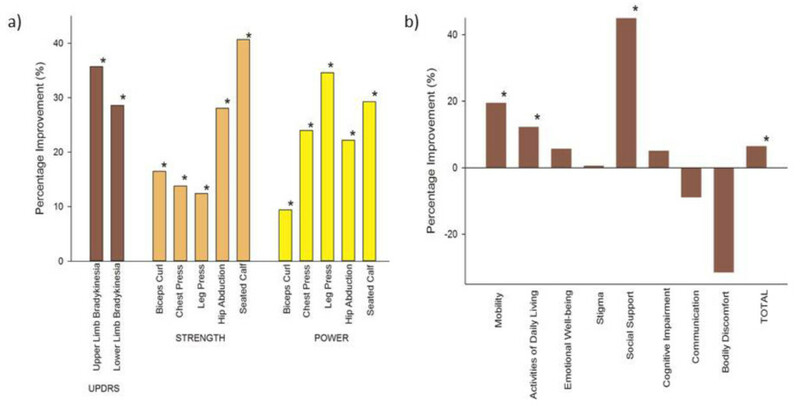 Percentage changes in a) upper and lower body bradykinesia, strength and power; and b) quality of life (PDQ-39) due to our high-speed training intervention. *significant change across the training period. The effectiveness of our intervention can be seen in Figure 2a and b showing Unified Parkinson’s Disease Rating Scale (UPDRS) upper and lower limb bradykinesia scores; one repetition maximums (strength) and peak powers on selected exercises, and quality of life scores (PDQ-39). These results supported the use of our targeted high-speed training intervention with translational cycles for reducing bradykinesia and improving strength and power in Parkinson’s patients. They also demonstrate that these improvements positively affected activities of daily living, mobility, social support, and overall quality of life. We conclude that the positive responses seen in every measure, but one, provide concrete proof that exercise interventions should be designed to target the specific diagnosed needs of clinical populations. Power training induced change in bradykinesia and muscle power in Parkinson’s disease.